Click for more info Photo from Personal Collection E.H. Scott "Quaranta" This is a link to the description of a rather impressive and unique 48-tube E.H. Scott Quaranta which I had briefly in 2001/2002 after acquiring it from Jacques Dubois in France. The set was sold in early 2002 to Gerry Steffens in Minnesota who has been quite resolved in fully re-establishing this set to more stringent standards in terms of original parts while conforming to E.H. Scott design specifications - as Gerry has found out, the ensemble, though impressive, has quite a ways to go before this is achieved. This Scott set is now in the best of hands and I trust that Mr. Steffens will share his progress at some point in the future! If anyone wishes to get in touch with the new owner of the Quaranta, his email address is gsteffens@bevcomm.net and he would be pleased to discuss anything E.H. Scott and McMurdo-Silver. Excellent May 2004 Antique Radio Classified web article on the Quaranta by Norman Braithwaite. Here is another webpage with photos of E.H. Scott radios. This radio is featured on page 65 in the excellent book "Musée de la Radio" by Marcel Cocset (Editions du Lys de Reims) published around 1999. Here is a website in France which shows a number of vintage Péricaud radios. Click for more info Source: Personal Collection Clarion Junior Model AC-60 Cathedral Purchased in July 2007 on eBay Canada from a great fellow in Saskatchewan. 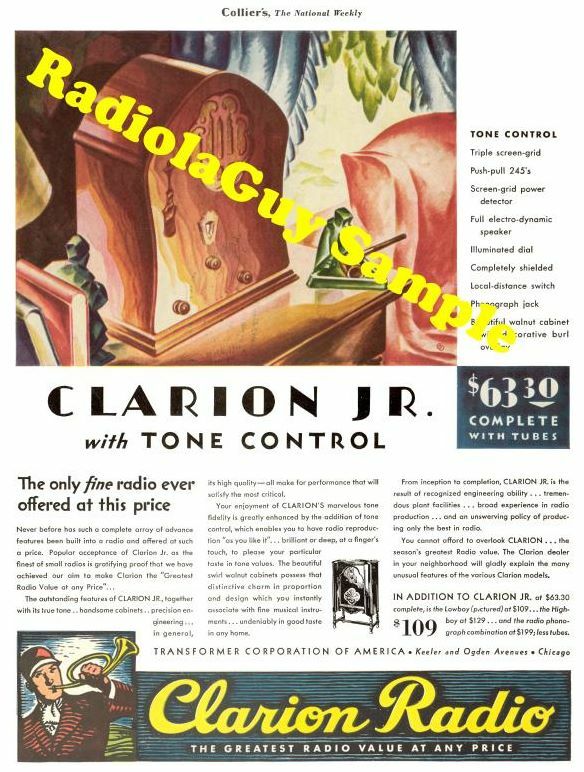 The www.radiolaguy.com website has the following photo of a magazine for the Clarion Jr.
Click for more info Source: Personal Collection Freshman Masterpiece TRF radio with internal speaker (1925/1926). Purchased at the OVRC auction in the spring of 2007. Model 6F5? Click for more info Source: Personal Collection 1930's small wooden tabletop radio Unknown model and manufacturer. Any information would be appreciated!